This webinar aims to provide users with an overview of GDPR and the principles of privacy and data protection including roles, responsibilities and processes under the Regulation. Join us for a webinar on May 24, 2019 at 11:00 AM IST. GDPR is now one year old. Learn about those 5-7 most challenging things to implement in the regulation. The Right to delete, data retention policies, DPIA, Legitimate Interest and consent. Speakers - Multiple Speakers with Data Privacy Experiences. Join us for a webinar on May 24, 2019 at 03:00 PM IST. May 24, 2019 at 04:30 PM IST. One year of GDPR and several penalties and fines imposed. Learn from the case studies on what went wrong and what was the magnitude of the fines. Learn also to avoid these mistakes in your Data Protection Practices. Speakers - Multiple experts from the Data Privacy Domain. Join us for a webinar on May 24, 2019 at 04:30 PM IST. May 25, 2019 at 10:30 AM IST. What are the low hanging fruits in GDPR such that the most critical pieces can be implemented with least amount of time and money. What do you absolutely need and what is good to have. Learn it all in the one hour webinar. Join us for a webinar on May 25, 2019 at 10:30 AM IST. May 25, 2019 at 12:00 PM IST. Join us for a webinar on May 25, 2019 at 12:00 PM IST. May 25, 2019 at 03:00 PM IST. The webinar covers the salient features of the Indian Personal Data Protection (PDP) Bill 2018. The webinar also covers the alignment of Indian regulation to global data privacy practices. 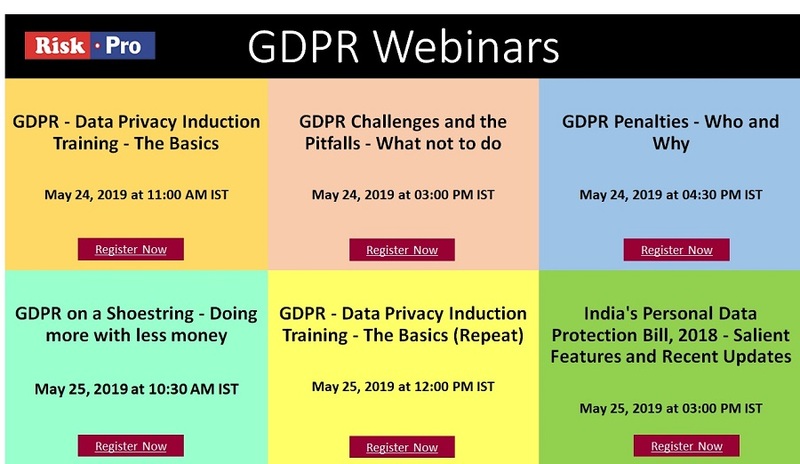 Join us for a webinar on May 25, 2019 at 03:00 PM IST.